Same issue just happened to me. How long is this supposed to last????????????????????????????????? 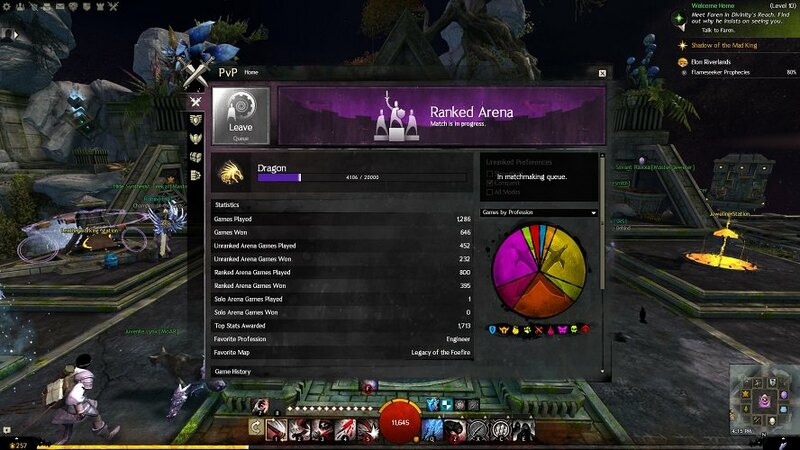 Real tired of Anet not addressing the pvp issues! "Match is about to begin" , We had a full team and we got stuck. 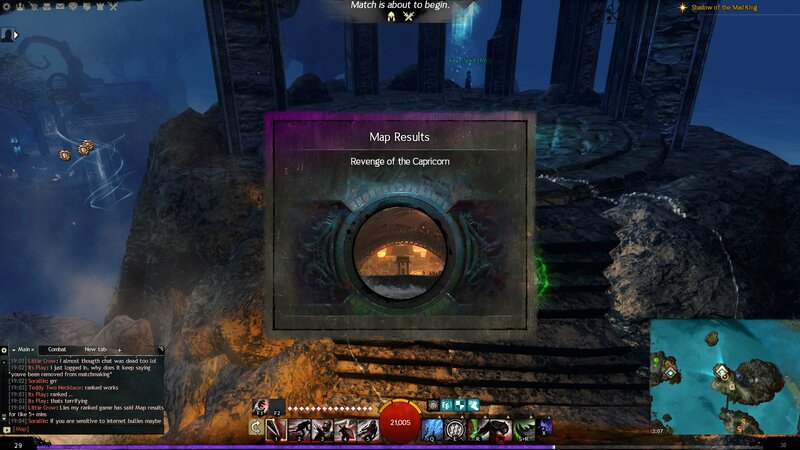 Tried restarting and moving map but nothing seems to help, the "Enter PvP" and "Leave PvP" buttons won't work either. Not able to re-queue. Help Help I'm stuck in a match and can't get up.... wait... but really though. I'm stuck. Thanks for you help in advance! I'm stuck, too. Been showing "Map Results" for the last 10 or so minutes. Recently finished a match in Skyhammer. Leaving the match just sends us right back into the completed match over and over. Also just finished a match in Sky hammer and nothing is working to get us out of the PVP game, it's groundhog day no matter what we do. HELP! Me and my brother also stuck at "Match about to begin"
Stuck in "Match is in progress". Stuck with "Match is in progress". Game has been over for around an hour now. I'm perma stuck in a match that i already won... and it didn't register as a win on my record score card. unrelated: I also can't join fractal parties, everytime i join one and i change map, client crashes and I auto leave the party.. Same issue.. groundhog day after PvP and now it says I've abandoned my match so I can't play anymore. Is there any devs around?? Hello?? I finished one game earlier, left to go do some guild events, came back a few hours later and it says 'PvP Abandoned' when I click to play. Also stuck in a phantom match that is not allowing me to queue. Same as the screenshot above. I'm stuck in queue and also have a pop up whenever I log in or switch maps saying my game can't connect to the server when I am clearly connected. Legends of Nocturnal [LoN] Recruiting! Inbox me ingame for details! Hey come on devs i've been stuck on queue for about 6 hours now!!!! Same here. Getting removed from matchmaking when trying to queue. I'm still stuck. This happened 20 minutes before yesterday's patch. Today I login and get a pop-up saying I can't connect to the login server and a PvP match in progress. Help! Not stuck but can't queue - it just says "abandoned" every time I click "play unranked"
Stuck in "Match is in progress" over 12 hours. Please fix it asap. Hello, I'm stuck as well with Map results blocking my screen. Re-logging and character select will show the same. Stuck in a match since last night. Save me! Can't Queue at all.. No message either. It doesn't matter if I click on ranked or unranked it does nothing. I am stuck in a match please help. I was stuck on the PvP map for about 20 minutes. After switching to another toon, I was able to free my stuck toon from the map however I am still unable to queue up nor leave my current queue.